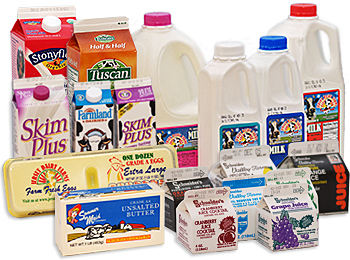 Our Dairy Products are rBST*- FREE ! All our dairy products are made with Pure Milk with No Added Growth Hormones. * rBST (Recombinant Bovine Somatotropin) or rBGH ( Recombinant Bovine Growth Hormone) is a controversial, genetically engineered version of the Bovine Growth Hormone used for increasing milk production in cows. 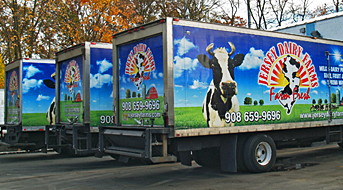 Jersey Dairy Farms - is a specialty dairy distributor serving Central and North Jersey, New York City and Staten Island. We specialize in high quality soft serve dairy mixes, beverages, eggs, Yogurt and water. 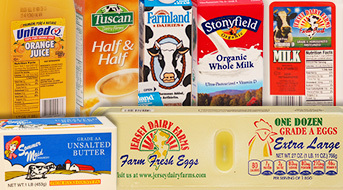 Jersey Dairy Farms receives its products from many different sources. We, therefore, find it necessary to closely monitor the quality of those products. Our fine products are available through a variety of retail, grocery store, foodservice, drug store, mass merchandiser, convenience and school locations. BECOME A JERSEY DAIRY FARMS CUSTOMER! Simply, call 908-659-9696 and our customer service team will guide you through the ordering process. We deliver in NJ, NY City and Staten Island. Jersey Dairy Farms products are, quite simply, the very best you can buy. Why? They come from special cows that live and work at our state-of-the-art farm facilities. We treat our herd like family, making sure it has plenty of healthy food to eat, pleasant living conditions and the best possible care. We pledge not to treat our cows with rBST, either, so we can guarantee a superior quality of milk. So eat, drink and love dairy! You’ve found the best.